Railways Recruitment Board (RRB CEN 03/2014 ) is going to conducts the Examination of Stenographer and Other Posts. RRB CEN 03/2014 admit card /Hall Ticket / Call Letter download and application status can be done here. Admit card of Railway Recruitment Board (RRB) examination for Stenographer / Jr. Translator and Other Posts are being issued to applicants for the test. Facility to check application status (rejected / not-rejected) is given here, as published by respective RRB websites for the examination to be held on 11 and 18 January, 2015. Know here complete details of RRB CEN 03/2014 Admit Card, Application Status for Stenographer / Jr. Translator and Other Posts. The admit card of RRB CEN 03/2014 for Stenographer, Junior Translator and other posts are published here. Candidates can also check the status of their application form and know whether their forms were accepted or rejected. Candidates can verify their eligibility from the website of RRB concerned. The Admit card to the provisionally eligible candidates will be sent by RRB concerned by post well in advance of the examination. Admit card/e-admit card shall also be available TWO weeks before commencement of the written examination on the website of RRB concerned. 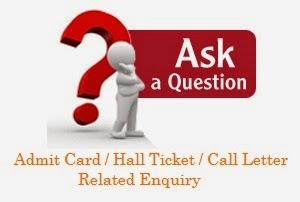 You can download admit card of RRB CEN 03/2014 two weeks before the exam. If you have downloaded RRB e-Admit card, you need to bring the following documents to the exam hall. A valid Photo ID such as the following, in original into the examination hall, failing which candidates shall NOT be allowed to appear for the written examination. School/ College / University Photo ID card. Candidates must also bring two colour photographs (of size 3.5 cm x 3.5 cm), with clear front view of the candidate without cap and sunglasses, for appearing in the written examination. RRB(s) will not entertain any request for any change in examination centre allotted to provisional eligible candidate(s).